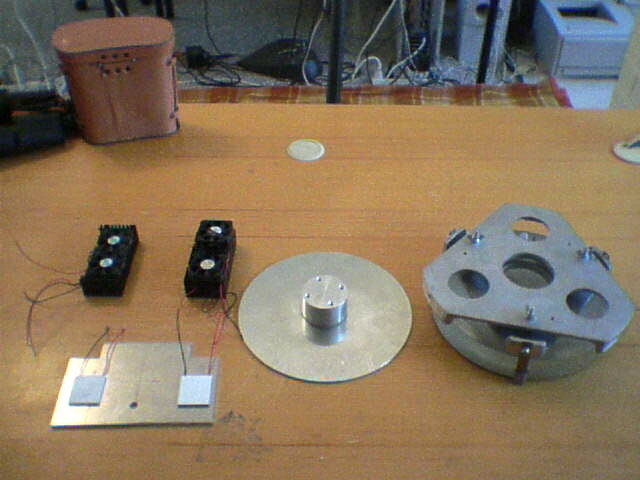 This section describes the electric heat pump that I have constructed to help in cooling the main mirror of my 10" newtonian. Part 1 of this saga is here. I had to find a way to attach a cooling unit to the mirror. The mirror cell (made from cast aluminium) is a very open design, with a 70mm diameter hole in the centre that goes all the way out the bottom of the cell. I decided to use this hole as the main thermal conduit to the mirror, using a cylinder of solid aluminium that would fit into this hole, and bolt onto an aluminium cold plate the same diameter as my mirror. The mirror sits on the cold plate (but is not firmly attached so as to avoid thermal stresses on the mirror). Update The mirror no longer sits on the cold plate, but now sits on its flotation points again and these points in turn are attached to the cold plate. 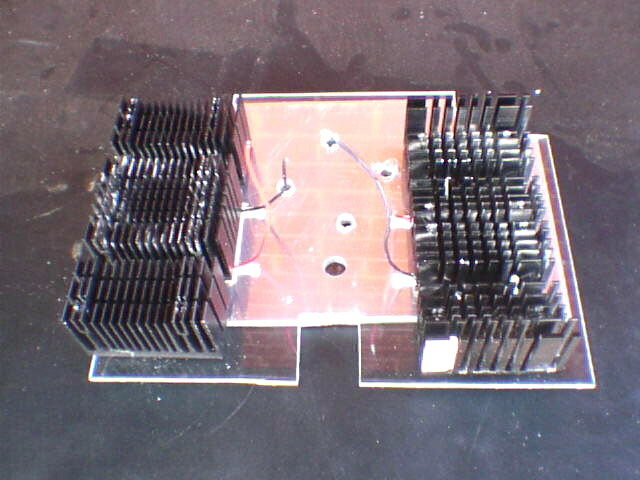 The heatsinks and fans (top) and the peltier units and their aluminium plate (bottom). The 10" aluminium plate and solid aluminium cylinder with mounting threads. 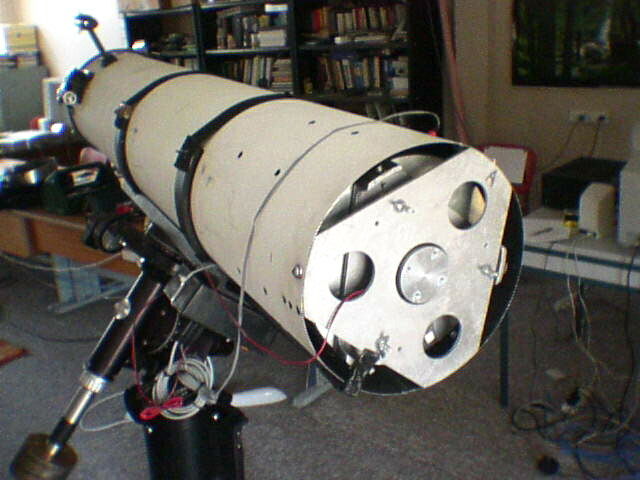 The mirror cell and mirror (upside down) showing the mounting hole in the centre. 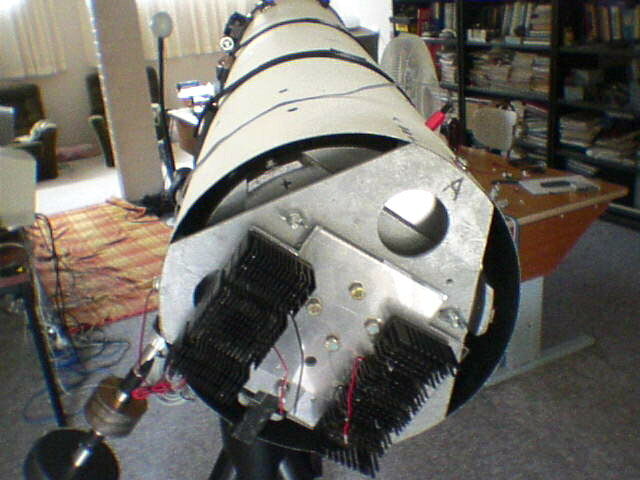 The mirror cell back in the scope with the aluminium plate and cylinder fitted. The mirror sits on the plate with lots of thermal paste applied to help the transfer of heat from the mirror to the plate. More thermal paste was used between the plate and the central cylinder. Update Due to concerns about inducing astigmatism with the cold plate directly touching the mirror, I have swapped the location of the cold plate and flotation points around so that the mirror now sits on its flotation points again, and these points in turn are anchored to the cold plate. That leaves a gap of about 3mm between the back of the mirror and the cold plate. I'm happy to say that after testing the new arrangement I am still getting excellent results, showing that the cold plate doesnt have to actually touch the mirror to work. Closeup of the cooling unit showing the two heatsinks (fans removed) bolted onto the hot sides of the two peltiers. There is a 3mm thick layer of perspex between the heatsinks and the cold aluminium plate to thermally isolate them. This does not interfere with the operation of the cooler since the peltier units themselves are 4mm high. The cold side of each peltier is in thermal contact with the aluminium plate (more thermal paste) and the hot side is in contact with the heatsinks (more thermal paste). The four holes in the middle of this unit line up with the four holes in the aluminium cylinder in the centre of the mirror cell (previous image). The cooler bolted onto the mounting block. All that is left to do is re-attach the fans ( removed to gain access to the bolt holes in each heatsink) and apply some power. The RED is the mirror temperature. The GREEN is the air temp inside the tube (near the mirror). The PURPLE is the external (ambient) air temp. The cooler was switched on as soon as the scope was set up. Looking at the left hand side of the graph we see the mirror temp drop rapidly compared to the ambient temperature. If you compare this to the graphs given in part 1 of this project then it's clear that the active cooler is more than able to do its job. The cooler was switched off when the mirror temp approached ambient (about 1840). This is when I discovered that my heavy-duty 12v power supply caused enough of a voltage spike to crash the temperature logger whenever it was turned on or off :-( (hence the gaps in the graph). Just before 1930 I switched the cooler on again for another test. You can see that the mirror temp starts to plummet very quickly. Also note the effect on the internal tube temperature (green line) caused by unwanted warm air from the heatsink/fans leaking into the bottom of the tube. When the cooler is operating, enough warm air leaks into the tube to raise this temp by a degree or so. While not serious, this intrusion of warm air into the tube is not wanted. I'll probably have to construct a shroud of some sort to stop this happening. The rest of this graph shows me waiting patiently for the clouds to part... which they singularly fail to do. I don't bother reattaching the cooler later in the night... it's starting to look like no real astronomy will be done. By about 2am it's time to pack up and head home. Update Part 3 of this series is now available here.